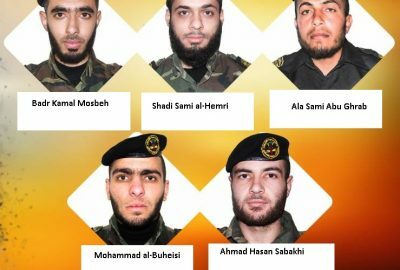 A statement released by the Al-Quds Brigades, the armed wing of the Islamic Jihad, revealed that the bodied of five of its fighters have been recovered from the rubble of the tunnel, which was bombarded by the Israeli army last Monday, bringing the number of confirmed deaths to twelve. The Brigades confirmed the bodied Badr Kamal Mosbeh, Ahmad Hasan Sabakhi, Shadi Sami al-Hemri, Mohammad Kheireddin al-Buheisi and ‘Ala Sami Abu Ghrab, have been located under the rubble. It added that despite Israel’s usage of advanced warfare technology, especially the special equipment it uses to locate tunnels, the fighters managed to dig tunnels that extended hundreds of meters across the border fence. Last Monday, the brigades declared the death of seven fighters; five of its members, and two from Al-Qassam, who were among many who rushed to their aid after Israel bombarded the tunnel. It added that the two fighters were killed in a second explosion resulting from an Israeli missile, after they rushed to the aid of the five Qassam fighters. The brigades identified the fighters as; the head of its Central Command, Arafat Mershed Abu Abdullah, his deputy Hasan Abu Hassanein, in addition to Ahmad Abu Armana, 25, Omar al-Faleet and Husam Samiri. The two fighters of Al-Qassam Brigades, the armed wing of Hamas, have been identified as Misbah Shbeir and Mohammad al-Agha. It is worth mentioning that, on October 31st, the wife of Ahmad Abu Armana, gave birth of a child, and named his after his father. The Palestinian Civil Defense said that many Palestinians are still missing under the rubble, and that the search has been impacted by many factors, including the toxic fumes, and Israel’s refusal to allow the Red Cross to search for their remains on the Israeli side of the border. It added that Israel is trying to bargain with the Palestinians, by demanding to receive information about Israeli soldiers, who went missing during Israel’s war on Gaza, in the summer of 2014, in exchange for allowing the search. It also stated the chances of finding any of the missing Palestinians alive are rapidly dropping while the Israeli military continues to refuse any type of search and rescue on its side of the border. On its part, the Legal Center for Arab Minority Rights in Israel (ADALAH), and the Al-Mezan Center for Human Rights, in the Gaza Strip, have filed a petition with the Israeli Supreme Court, demanding the court order the Israeli military to allow Palestinian search and rescue teams from Gaza to enter the “buffer zone” – a “sterile” strip along the Palestinian side of the Israel-Gaza border that routinely comes under Israeli fire – to locate and rescue people trapped in a tunnel destroyed by the Israeli military. The petition was filed on behalf of Gaza resident Hassan Abdel Jalil Sbahi, the father of one of the missing individuals, against Israel’s Coordinator of Government Activities in the Territories (COGAT) Maj.-Gen. Yoav Mordechai and the Israeli military’s Southern Command chief Maj.-Gen. Eyal Zamir. The Al-Quds Brigades, the armed wing of the Islamic Jihad has declared the death of five of its fighter under the rubble of the tunnel, which was bombarded by Israel last Monday, leading to the death of seven fighters. Israel is still preventing Palestinian search and rescue teams from entering the area, where the tunnel was bombarded, bringing the number of Palestinians, who were killed in the tunnel incident since last Monday, to twelve. Al-Quds Brigades said the five fighters are Badr Kamal Mosbeh, Ahmad Hasan Sabakhi, Shadi Sami al-Hemri, Mohammad Kheireddin al-Buheisi and ‘Ala Sami Abu Ghrab. It added that, after five days since the Israeli bombardment, the fighters remain buried under the rubble, as all efforts to find them have failed, especially since Israel is refusing to allow Palestinian Civil Defense teams to cross the border fence to search for them. It is worth mentioning that seven fighters, five from Al-Quds Brigades, and two from Al-Qassam Brigades of Hamas, have been killed in the aftermath of the Israeli bombing, when they rushed to rescue the five Palestinians from the bombarded tunnel. It is worth mentioning that the Israeli army placed a huge sand hill near the area of the bombarded tunnel.